I can remember the time I met Nick back in 1998. It was at The Cumberland Hotel in London for an interview with Lars Ulrich. At the time Nick was writing for the Greek edition of Metal Hammer and I was part of the editorial team of Metal Invader magazine. It was a (kind of) press conference with Lars and we were packed in a hotel room with another 15 or so journalists from all around the world! 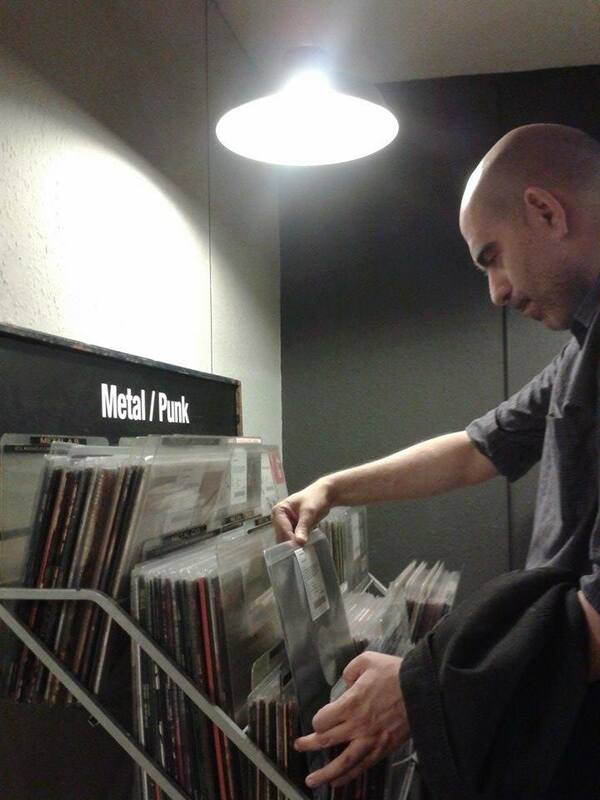 Thanks to the internet and facebook in particular we met again and we can continue our conversation on Metal music and of course on collecting Metal. At the time of the interview (July 2014), Nick is 38 years old and works as a full time English language teacher. 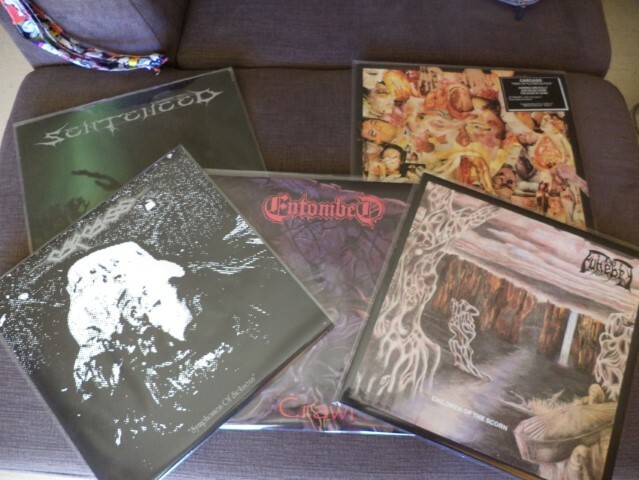 See how he experiences collecting and what his teenage pupils are thinking about music in general, about Metal and about owning physical items. I â€˜ve stopped counting years ago. A rough estimate should be around 850 LPs, 2000+ CDs, 350 EPs and 500 promos (love those!) â€“ a few original tapes and demo tapes can be found as well, about 150. Do you collect a specific genre? Of course, I donâ€™t collect just for the sake of it. Everything revolves around Death/Thrash/Black and a bit of atmospheric Metal. Things are a bit wild in that department. I try to have all the Slayer items next to each other but when a new Slayer item comes in I must admit I â€˜m a bit lazy to move all other items to make space for the new arrival. No, everythingâ€™s stored in my hard drive, namely my brain. So far it has worked flawlessly; never bought an item I already owned. What were your first items in your collection? Some Iron Maiden CDs. Got rid of those plus some other classic Heavy Metal and Power Metal stuff I bought during the first months of my wandering around the world of Metal music. 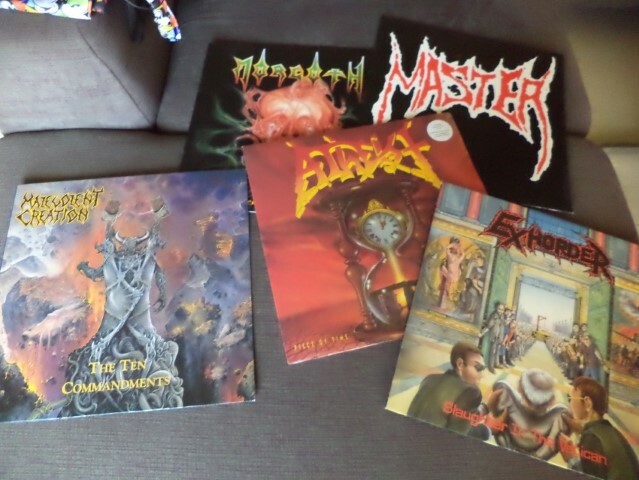 I respect those old established classic Metal names but they are not for me. Which are your top places to buy music? Do you also download music? Yes I do. I cannot spend 100 euros on an old demo tape and even if I could afford such purchases, I would probably never play the tape and still listen to the mp3 files which were uploaded by someone who has the time, the drive and the passion to do that. I feel grateful to those people actually, I can arrange great collections of old demo tapes and 7â€™â€™s to listen to on my iPod. I should also point out downloading has given me the opportunity to check out some totally obscure releases selling for big $$$ and decide for myself if this CD or LP about which I was totally clueless is worthy of tracking down or not. â€˜Rareâ€™ means nothing to me personally and I â€˜ve always hated the â€˜rare itemsâ€™ section in the stores; do I like the music on it? 10 copies or 100.000 copies in existence make no bloody difference to this chap here. For some items yes I can totally relate to what you said; I just got to have that! Donâ€™t ask me why, I just need that extra copy of â€˜Into The Pandemoniumâ€™ on LP that is going to look nice together with the other 4 I own already. The "driving forceâ€ has always been the love for the music, those incredible extreme metal sounds that have been with me for 22 years already. But why someone needs 5 different original vinyl versions of â€˜Into the Pandemoniumâ€™, one may still ask? Good luck with all the different answers you â€˜ll be getting mate! Do you have any metalhead students? Have you talked to them about your hobby? Do they buy music at all or they only download? Things have changed drastically in that department. When I was at high school, you could see a number of kids wearing their Metal t-shirts with pride, talking about bands and albums and gigs and everything Metal-related. Yes, we could say Metal music was a bit of a fad back then in the early '90s and some or perhaps most of those kids never developed a real liking for the music; it was their short-lived teenage rebellion phase and putting on an Iron Maiden t-shirt probably made them feel so anti-everything, heh! To come to the present though, the situation is completely different; yes, I do happen to have some students who enjoy their Metal but they are few and far between. Most teenagers these days view Metal as a music of the past, much in the same way as we viewed bands like The Beatles. Hip-hop and its sub-genres is the current trend and kids want to be 'cool' and 'in' (are these terms still in use? They 're so early '90s but I 'm an old dog unfortunately! ), so it's only natural they like - or think they like, but that makes no real difference- that stuff. Most of my 'metalhead' kids listen to the classic Metallica, Iron Maiden and Black Sabbath stuff and only a tiny fraction would listen to other bands/genres, though I distinctly remember one or two cases when you could tell this kid has a real passion for the music (and that brought a smile upon my face indeed). Buying music seems like a joke to them as everything's easily accessible and by a few clicks they can check out whatever band they want. It strikes them as odd that I listen to that kind of stuff ('cause you can never avoid their questions regarding the music you like, your football team, etc. forever!) and when I tell them I have so much physical items at home they look at me like the man who fell off the moon or something! To sum things up, like it happened with other musical styles such as Jazz or Soul music, fans of our music are aging too and there's no real stream of newcomers into it, therefore things look a bit bleak. Have you been selling items from your collection? Any regrets of an item you sold in the past that you shouldnâ€™t? I have sold quite a few items throughout the years and still do; items bought because I was thinking things like "come on, this is Immortal and you love this band so the new album is bound to be greatâ€. And after purchasing and listening to â€˜Sons Of Northern Darknessâ€™ I felt like an idiot for spending my money on that piece of crap! So, that CD had to go because every time I laid my eyes on that particular rack at home and saw it there I was getting the exact same feeling. Or several items bought during my magazine years; items bought for the completely wrong reasons! Metal Hammer Greece was/is an incredibly influential read and when I was asked to join it, that felt like the world to me. Lots of stuff was purchased under the notion that now, since I am a part of the mag., I ought to be a little more open-minded and try out new bands and sounds. You had to seem knowledgeable and up-to-date with that was going on in the Metal scene and I â€˜m not afraid to admit I â€˜ve lost it to some extent. Buying stuff because there was lots of hype around them and excitement among other members of the magazineâ€™s team and you had to share that and embrace the "next big thingâ€. The end of the magazine era was a real turning point (not just music wise but letâ€™s focus on that); I got my facts straight and realized, once and for all, that your musical taste is a personal issue and you should create your own theory around it away from norms. You like to keep your Possessed records next to your Pink Floyd and Polka music records and thatâ€™s totally fine because itâ€™s you. Therefore, the vast majority of those "magazine-influencedâ€ purchases were sold in 3 batches as this stuff wasnâ€™t me. 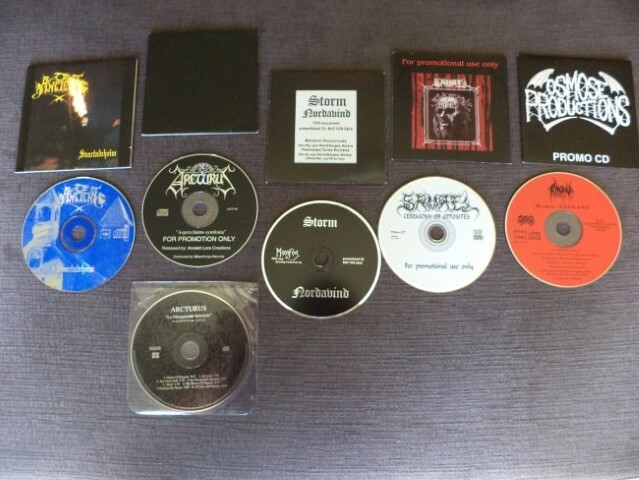 Some CDs have survived the blaze and can be seen on my racks still, as a reminder of the things that should not be (Slipknot, for fuckâ€™s sake!). These days I only sell items I manage to find upgrade copies for,first. I â€˜ve always paid great care to the storage and handling of my stuff but some albums were originally bought second-hand and not in the best condition exactly because you couldnâ€™t resist the temptation so, these days, every time I score an upgrade copy the old one has to go and the money is used to fund the next round of purchases. Regrets? I had a few, heh, but I â€˜ve managed to correct the most dreadful of my selling mistakes. I â€˜ll go for sentimental value because if you start looking at your items and think to yourself â€˜this is a 500-euro LP and this one next to it sold for 150 euros last weekâ€™, then soon enough that thought would seem quite tempting. 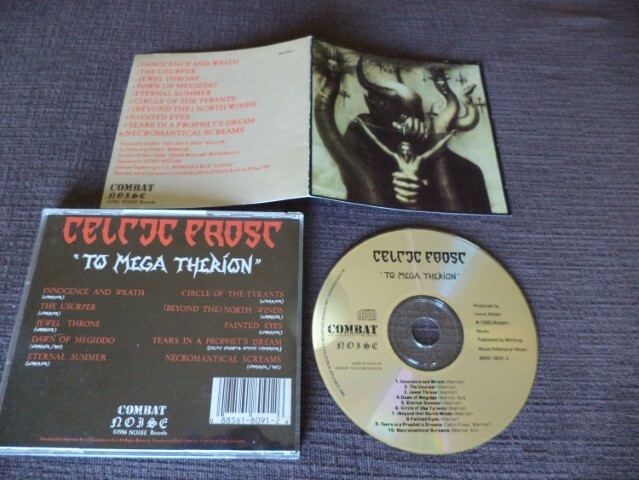 The "JilemnickÃ½Okultistaâ€ original self-financed CD is by far my most beloved item and I could go on talking about this album and Masterâ€™s Hammer for weeks, so letâ€™s keep it short. My â€˜Askeâ€™ and â€˜HvisLyset Tar Ossâ€™ original records as well, the original â€˜De Mysteriisâ€¦â€™ gatefold-LP plus my â€˜Battles In The Northâ€™ original clear vinyl. How many items are on your want-list right now? There are about 200 items in my want-list but for some of them itâ€™s just wishful thinking because they sell for incredibly high prices and I have a certain money limit I â€˜ll never break for any item. I cannot spend 150 euros on a record I held in my hands at some point but wasnâ€™t able to purchase because money was short back then, it feels ridiculous. Family and kids? No. And I am the only one allowed to touch, breath and generally speaking be around my items, every time someone makes that step closer I get dizziness and my stomach gets seriously upset. Best days of my life! Waiting to receive the package with that demo or EP from the band or the stuff you ordered directly from the label after reading a couple of nice reviews in zines. Luckily, the vast majority of those purchases back then were highly successful and thatâ€™s because the early â€˜90s were the times of true talent and brilliant music! But when that album was not to your liking you felt like somebody punched you in the stomach because you had to save all of your pocket money for weeks before being able to purchase that CD! Havenâ€™t thought of that actually. Probably have everything burnt to ashes instead of having my stuff end up in the hands of a second-hand store owner. To all private sellers who wish to offload their stuff; you are after maximum profit and this is totally fine but please do not overgrade your items because (and the majority of my good collector friends agree on this) there is a zero tolerance policy against beat up copies offered as NM ones. Price your item according to its present time condition! I â€˜m terribly sorry but if you happened to spill beer on the sleeve or your cat had its fun with your records then we should know beforehand! !